Eastside Village is an interdependent, intergenerational community of neighbors helping neighbors. Our members are individuals and couples who prefer staying in their homes and neighborhoods rather than moving into retirement communities. However, the Village is not just for those near or already into retirement. It’s for people of all ages who value being part of Portland’s eastside community and want to strengthen their link to it, including through volunteering. Membership is open to all residents of this area age 18 and older, to include people with disabilities who are not yet seniors. 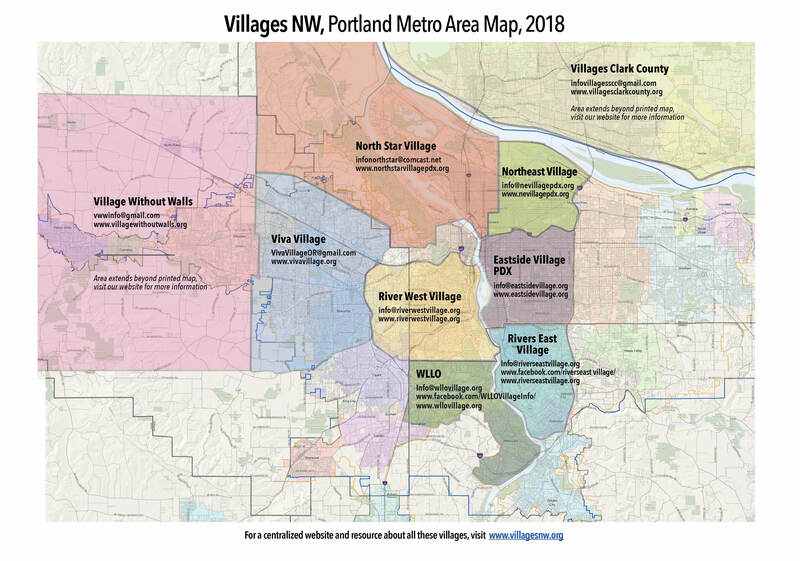 Initial outreach for Eastside Village was made possible in part through grant funding from the City of Portland and SE Uplift’s Neighborhood Small Grants Program. 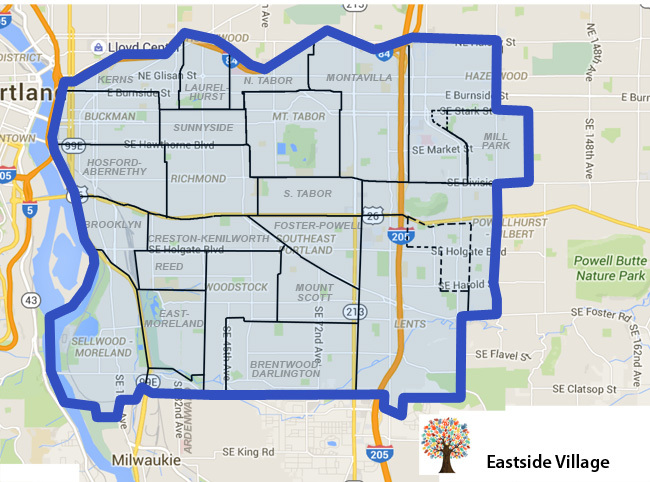 The Eastside Village boundaries are the Portland city limits on the south; the Willamette River on the west; I-84/Banfield or Halsey (east of I-205) on the north; and SE 122nd on the east. Our mission is to build a strong, lasting, intergenerational community and to engage and coordinate a network of trained volunteers and high-quality service providers to ensure that our members are able to age at home and in community safely, affordably, happily, and healthily for as long as they choose. Enabling people to age in community and do as much for as little cost for as long as possible. To that end, we are a “volunteer first” Village that develops smart, practical, and cost-effective ways to address our members’ needs. Recognizing and celebrating our mutual interdependence and our lasting commitment to each other over time. Fostering community and building strong, caring relationships. Appreciating the richness and diversity of our Eastside Village neighborhoods. Being inclusive of and welcoming to people of all ages, races, faiths, ethnicities, genders, sexual orientations and gender identities, and socio-economic levels. Treasuring the willingness of the members of our Village and the wider community to volunteer their time and expertise in support of our mission, and striving to ensure that volunteers’ work with Eastside Village is always meaningful and appreciated. Valuing intergenerational connections as an integral part of Village life. Honoring the privacy, dignity, and independence of our members and volunteers. Protecting the security of our members and volunteers in dealing with vendors and service providers. Valuing the advice and opinions of our members and regularly soliciting their feedback on village programming and volunteer and vendor services. Fostering a climate of growth, exploration, and lifelong learning in our community. Valuing and actively seeking opportunities for mutually beneficial partnerships and collaboration. Creating a Village that is owned by its members and stewarded by community-elected servant leaders. Being innovative and agile with our programs and services; staying abreast of new approaches and technologies; responding gracefully to changing times and evolving member needs. Being committed to enduring and sustainable growth and the wise and prudent use of all Eastside Village resources. The all-volunteer Village Council is responsible for overall policy and direction of the village, and delegates responsibility of day-to-day operations to the staff and committees. The Villages NW Hub and Spoke Network has experienced exciting and explosive growth. It has eight spoke villages in various stages of formation in Multnomah, Washington and Clackamas counties. Villages NW is the nonprofit hub of the network. Its mission is to enable more Pacific NW residents to successfully age in place by developing and nurturing a network of sustainable, community-based villages throughout the region. As the network hub, Villages NW serves as catalyst, coach, incubator, public educator, advocate, partnership developer, corporate and foundation fundraiser, and provider of administrative, HR, development and financial services for spoke villages throughout the Portland metro area and beyond, including Eastside Village. Learn more at the Villages NW website and the Villages NW resource library.